The “Flynn Block” on Burlington’s Main Street was all lit up last Saturday night. Two illuminated marquees announced the night’s performing arts offerings: On the MainStage, the area’s most successful theater company, Vermont Stage, was celebrating its 10-year residence at the Flynn — a dramatic departure, since VSC usually operates out of the more intimate FlynnSpace. But its MainStage gala made room for local lesbian comedian Martha Tormey to play the smaller venue. Her Flynn-sponsored solo show was a big step up for the “local comedy diva” who got her start on a shared bill at Higher Ground. Anyone concerned that the star-studded Flynn Center doesn’t support enough Vermont talent would have admired that view from City Hall Park. Only one thing was missing from the scene: executive director Andrea Rogers. The theater’s grande dame was taking a rare night off from the performing arts center she helped to found 29 years ago. Two days later, in a carefully planned press conference, she announced what some culture vultures thought they’d never hear: Rogers, 69, will be leaving the Flynn in June. In her prepared remarks, she said she had made the “difficult but important decision” to retire after almost 30 years in a job she “never envisioned” for herself. She left it to the organization’s first-ever board chair, John Gravel, to remind the crowd that without her, the former moribund Flynn movie theater could never have been transformed into the award-winning performing arts center that it is today. What details did Gravel leave out? In her zeal to build the Flynn, Rogers rubbed some people the wrong way. But even her detractors have to concede that no single individual has done more to shape Vermont’s cultural landscape over the past three decades. The question now is, can the next generation follow her act? Truth is, Rogers shaped me, too. 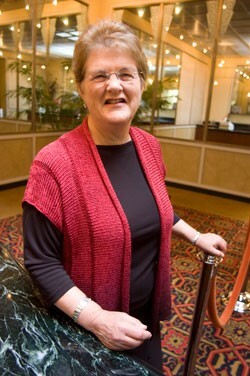 She was my first real boss when I got a yearlong, paid internship at the Flynn after graduating from college in 1983. Back then, the Flynn was not the august institution it is today; it was a start-up arts organization determined to bring a beleaguered building back to life. The mission was challenged by broken pipes, taxation scares, loser shows and a raging turf battle with the UVM Lane Series, which at the time was presenting world-class orchestras at Memorial Auditorium. From a front-row seat, I watched the Flynn restore its art-deco décor, launch a regional box office, cofound the jazz festival with fledgling Burlington City Arts and start bussing in kids for the student matinee series. Burlington began to see the world-class dance, music and theater acts in a setting as elegant as the occasions. I also got a good look at Rogers, who was heading two simultaneous fundraising efforts: a $1 million capital campaign to pay for the building’s rehab and a membership drive to support the Flynn’s ongoing operations. Until the theater got adequate offices, she worked out of a second-story space on the Bennington Potters block of College Street. Then artistic director Tony Micocci operated from a windowless room off the theater’s lobby that is now a handicapped bathroom. I worked for them both, doing marketing, graphic design, education, development and public relations. What I saw was that Rogers never seemed to leave the Flynn — except to meet with someone who might help the organization. She added personal, handwritten notes to donor thank-yous. She worked and reworked ad, brochure and newsletter copy until it had just the tone she wanted. Modeling the behavior she was asking of others, she gave large sums to the Flynn herself and often dug into her own pockets to show appreciation for all the volunteers — ushers, envelope stuffers, interns — who contributed time and energy to the cause. Over time, it became her cause. Micocci was hired on the assumption that he would assume the directorship of the Flynn when the capital campaign was complete. But Rogers proved so indispensable to the organization that the board kept her on as executive director. Micocci became the first of four “artistic directors” with whom Rogers worked over the years. “Tony was bold — sometimes brash — but bold. And lovable,” Rogers says in an effort to explain why the board established two leadership positions at the Flynn. “There needed to be a balance of some kind.” The artistic director curates the Flynn “season,” choosing the acts that will entertain and educate the community. The executive director supports those efforts with fundraising, strategic planning and board management. It’s Rogers’ job to keep the organization growing, and on solid financial ground. The Flynn’s endowment is valued at around $6 million. Rogers “was always really good at math” growing up in New Britain, Conn., where her father ran an electric valve manufacturing company that later sold to Honeywell. “He always wanted me to take accounting,” she recalls, but “I wanted to deal with people.” She majored in history, French and art history at the University of Michigan. Her first job out of college, for the New York-based American Field Service, almost qualified as social work. A part of it involved dealing with “problem kids,” resolving conflicts in families and schools. Rogers built on those skills when she moved to Vermont, in 1970, and took an organizing job with the Vermont Division of Alcohol and Drug Abuse. “I got a lot of experience walking into difficult situations and just trusting that I could get through it,” says Rogers. That confidence came in handy later when she had to personally ask donors to contribute to the Flynn. Rogers left the state job for an opportunity that called for vision and real business acumen: She developed and ran the Church Street Center, UVM’s noncredit community education program, at a time when adult classes in yoga and creative writing were few and far between. Within five years, “libraries, bookstores, fabric stores, high schools were all doing this stuff,” Rogers notes. What does it take to keep an organization vital? “I love the strategic challenge of thinking of what’s next, and kind of trying to orchestrate in that direction,” says Rogers. “Process” plays a big part in her approach — there have been eight “five-year plans” and seven multimillion-dollar capital campaigns over the decades. True to form, Rogers hired a consultant to assist in hiring her replacement. The day I interviewed her, Margaret Genovese was in the middle of talking to everyone on the Flynn staff — and some key outside players — to get a better read on Rogers and what qualities her successor should have. You learned to expect this vigilance from your boss as a member of the Flynn staff. I recall that Rogers never stopped reminding me to make sure the front doors shut properly behind me when I was the last one to leave the theater. She couldn’t believe that anyone — let alone an intern — fully grasped the importance of this security detail, when in fact I had already adopted her anxiety and couldn’t leave without double-checking every door. It’s no wonder this successful, almost-70 businesswoman plays tennis in her spare time. Rogers also loves to read, cook, sail and garden. There are lifestyle considerations, too. “I don’t want to miss anything when I’m in charge of it,” Rogers fesses. The Flynn’s schedule is packed all year round now, leaving little time for real vacations or for free evenings with her husband, retired engineer Avery Hall. All those things will be the responsibility of her successor, if Rogers’ plan plays out as envisioned. A national search starts this week. But how do you replace the “First Lady of the Flynn,” as Gravel called her back in the early ’80s? Rogers says the ideal candidate needs to “partner with everybody,” “balance business and programming excellence” and “embrace new possibilities.” And don’t forget those grant deadlines. Rogers has used grants to bring in more than $5 million over the years — just for the physical building. Kraft would add, “Teach the next generation how to be philanthropic.” She’s concerned that, as wealth gets passed from parents to children — “$8 trillion is changing hands right now” — the recipients may not embrace charitable giving the way their forebears did. She predicts that “there’s a whole new nurturing process that will have to take place” in the post-Rogers era. The area’s fragile arts ecology may hang in the balance.